Heavy rain (totál 33.0mm), heaviest durante la noche del viernes. Later becoming colder with a dusting of snow el sábado por la mañana. Freeze-thaw conditions (max 9°C el viernes por la noche, min -6°C el sábado por la noche). Winds increasing (Vientos ligeros desde el SSO el jueves por la noche, casi tempestad desde el SSE por la noche de viernes). A dusting of new snow. Freeze-thaw conditions (max 2°C el lunes por la tarde, min -8°C el domingo por la noche). Winds decreasing (vientos fuertes desde el NNO el domingo por la noche, calma por la noche de martes). La tabla anterior muestra el pronóstico de tiempo para Mont Tremblant en la altitud específica de 875 m. Nuestros modelos meteorológicos sofisticados permiten prever pronósticos para la cumbre, la mitad y la base de Mont Tremblant. Para aceder a los pronósticos de tiempo a otras alturas, pinche en la navegación en la parte superior de la tabla. Para una visión general, consulte el Mapa meteorológico de Canada. 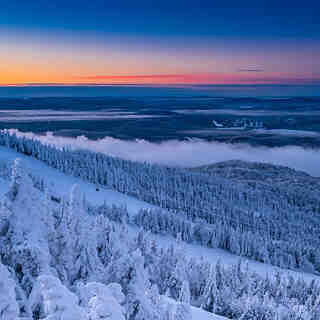 I have been skiing Tremblant for about 12 years now. During the week the skiing is excellent; not too many people (weekends are very busy). Runs are in excellent shape. 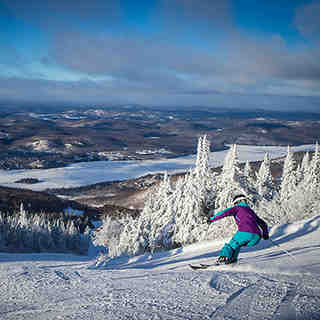 Remember, it is always windy at Tremblant. Prices in the cafeterias are steep. I always bring my own lunch. The T66 is a good purchase with the exception that they start it too early in the season. Therefore, one is wasting money because ski conditions are not great; runs are limited. I was up Dec 22 one year. Four runs open at the top only and two of them were occupied by the down hill racers. Who, in most cases, have the attitude they own the hill. I would recommend it as a place to go. Just bring lots of money for meals if staying over night.